If I were in Louisville I’m pretty sure I would, like almost everyone else in town, be much more interested in the upcoming Derby. 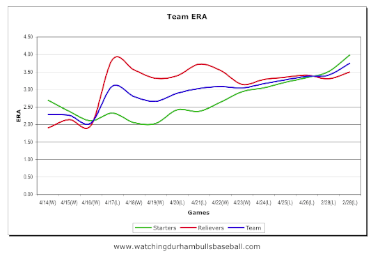 But this is, mostly, a baseball blog, so (sigh) let’s take a look at what’s happening to the Bulls. With the notable exception of outfielder Brandon Guyer, the Bulls bats are pretty quiet. For the pitchers, the Bulls are opening their own recuperation ward with three (two starters, one reliever) on the DL. Brian Baker’s had two starts for Richard De Los Santos, but he’s only managed to get through 6 innings (6 earned runs, 3 home runs). Jeremy Hall came up from Montgomery and did not have an auspicious start as a Bull (7 earned runs in 3 2/3 innings). But then Alex Torres, who looked a little shaky his last start in Durham really came unraveled back in Game 20 giving up 6 runs (3 earned) in 4 1/3. Another game in Louisville tonight, then off to Indianapolis. Let’s take a look at some trends. 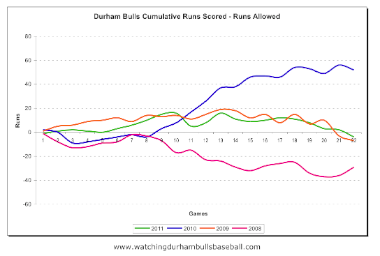 The Bulls are at .500 and the runs scored/runs allowed chart has dropped into negative territory. It's difficult to parse out pitching vs. hitting, but here are a couple of efforts. First, a look at the ERA trends. Not good over the last 15 games. I guess if you would like to apportion the damage, it looks like the starters need to pick up their game. Another way to look at the situation is to aggregate the team Weighted On-Base Average (wOBA) into a chart. Weighted On Base Average is one of those new stats that has a really good reputation as a measure of individual hitting performance. As a team stat it seems useful to me as a way to look at trends. 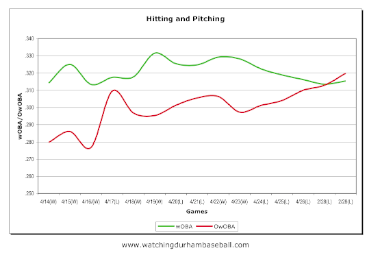 We can use the same stat, turned around, to get a handle on how our pitchers are doing by computing an Opponents Weighted On Base Average (OwOBA). Which leads to this ugly (if you're a Bulls fan) chart. 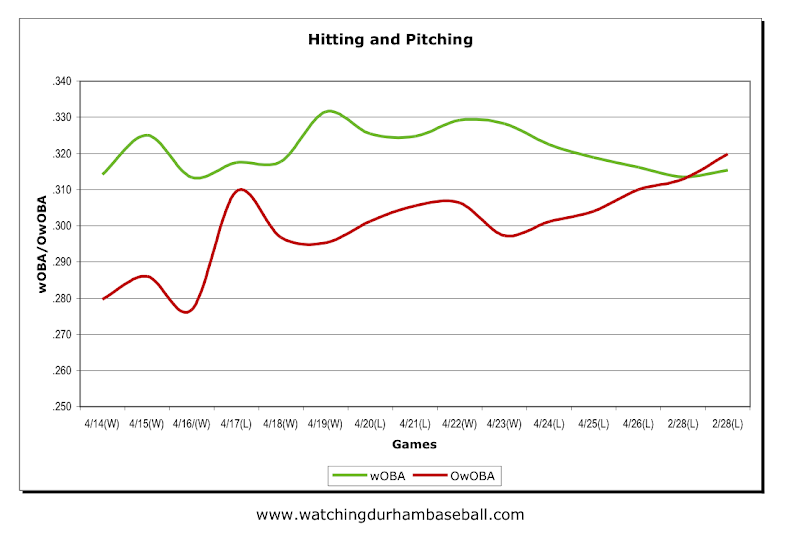 I may not be much of a statistician, but I'm pretty sure that you don't want the OwOBA trendline crossing the wOBA trendline. Let's have some decent weather, a good start from Alex Cobb (subject of an item over on DRaysBay a while back), and hit the road for Indianapolis. Unlike the horses in the photo above, baseball players don't run well in the mud.